Jersey Joe's Italian Eatery is Now a Wine Bar. It closed several years ago and was owned by Mayor Joe Carchio. It began as a delicatessen, but was converted into an Italian restaurant. Carchio sold the business to the owners of Beachfront 301 located in the same building, a mere four shops down. Located in Plaza Almeria, a beautiful building designed with elements reminiscent of Costa del Sol, Jersey Joe's face the International Surfing Museum on Olive Street (an appropriate name of a street where Italian food is served.) Other stores nearby include Cold Stone, UPS Store and Beachfront 301. Jersey Joe's started out as a deli-style cafe with a big refrigerator case but was transformed into an intimate dining room with a bar. Like most restaurants and pubs in Huntington Beach, there is a television to watch sports. The warm colors and nice decor blend with the ambience served up by Joe, his son, Jarod, and others who treat customers like friends and make them want to return. 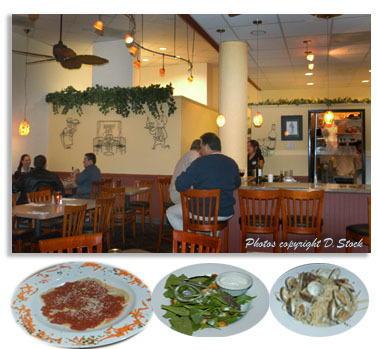 For Dinner you can dine on Chicken Marsala, Sausage & Pepper Campagnole, Linguini & Clams, Eggplant Parmigiana, Chicken Ravioli, Sea Scallops Arriabitta, Shrimp al Pesto, Grilled Chicken & Broccoli Scampi, Seafood Pescatore and more! Dinner Classics such as Cheese or Meet Raviolis and Dinner Entrees range in price from $8.99 to $18.99. Entrees come with soup or a house salad. For Lunch Jersey Joe's serves sandwiches, salads, Famous Jersey Dogs, soups and a Kid's Menu. Prices for lunch range from approximately $3.99 to $6.99 per item. Jersey Joe's is owned and operated by Joe Carchio. About Joe: Born and raised in New Jersey, growing up around famous restaurants and delicatessens, Joe learned a lot about making and eating all styles of sandwiches, pasta and pizza. He knows what it takes to prepare great food to satisfy anyone's taste. Joe also knows how to take special care of his customers, New Jersey Style. You will always feel like family at Jersey Joe's. Indoor garage parking is available at Plaza Almeria or outside coin meter parking.